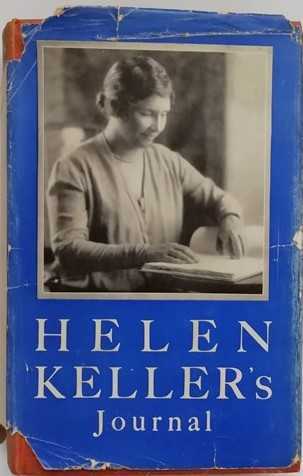 First UK edition first print hardback of HELEN KELLER'S JOURNAL by Helen Keller (with a Foreword by Augustus Muir) and published by Michael Joseph Ltd in 1938. Signed by Keller in pencil on the half title page. The book is in very good- condition (red cloth boards with gilt lettering to spine) with some age related wear, mainly small areas of colour fading here and there. Previous owner's name on the front endpaper. 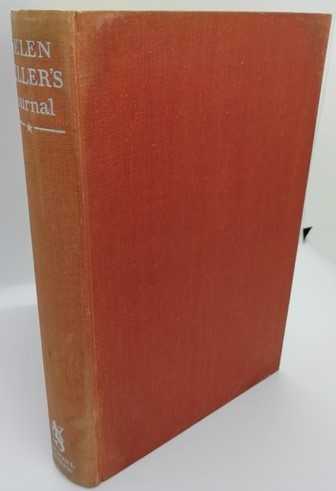 The book is in a fair unclipped dust jacket, which is protected in an archival sleeve, and has a couple of pieces missing from the top and bottom of the spine as well as sundry chips and small tears. Internally the pages are clean and tight. On March 3, 1887, a young Miss Annie Sullivan, but lately graduated from the Perkins Institution for the Blind in Boston, arrived in Tuscumbia, Ala., to begin the education of a deaf, dumb and blind child, not quite seven years old, whose name was Helen Keller. Teacher, the little girl called her on that miraculous day about a month later when she first discovered that things and people had names; Teacher she remained for nearly half a century until her death in 1936. 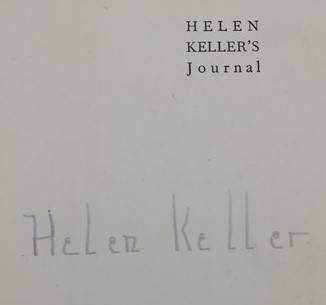 In this journal Helen Keller reveals her spirit in a way that no other book could and is surely one of the most courageous records ever published.